It’s almost summer! Buds have started appearing on trees, birds have started to return, the temperatures are getting warmer. Our official opening day of the summer, May 1, is rapidly approaching, we’re in the midst of the transition from winter to summer, and our excitement is starting to build for the upcoming season! We have expanded our fleet! We are now up to 15 vans available for rent throughout the summer. All of our vans are Dodge Grand Caravans, either model year 2016 or 2017, and the interior design hasn’t changed (except for a few minor tweaks). It’s still the same practical, functional and fun campervan that our renters fell in love with last year. With those tweaks, however, we have refined the design of the vans even further, so they’re even more functional and comfortable. For example: We have modified the hinge on the footboard behind the front seats, so that the lid of the storage box can be lifted completely even if the front seats are not moved all the way forward. We have added a third “leg” to support the table in the bed configuration to add a little more stability and support. And, we have updated the curtains in the van to make the interior darker when they’re closed, as well as sturdier and easier to clean. We’ve already attended a couple of travel shows this year, and we’ll be attending a couple more this summer. 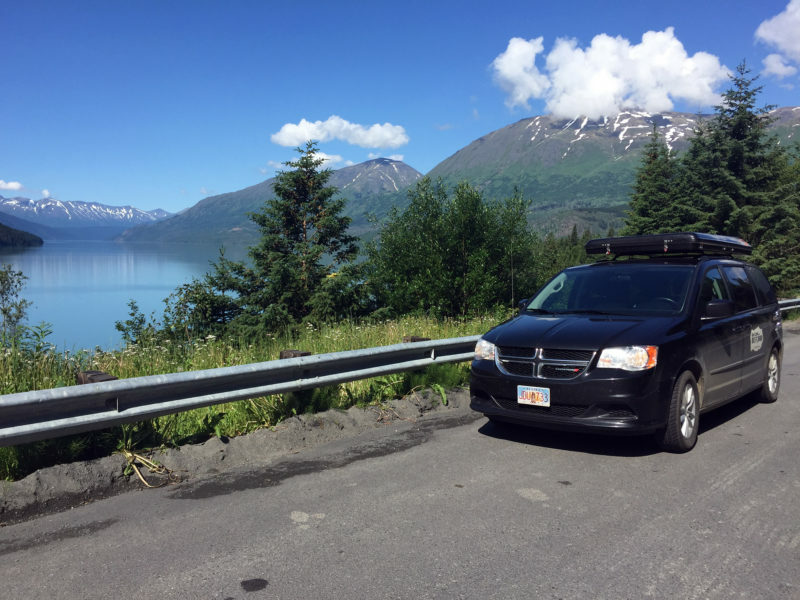 Alaska State Parks Ambassador Erin Kirkland of AKontheGo.com will be showing off one of our vans at the Kids to Parks Day on May 18 at Matanuska Lakes State Recreation Area. The event is designed to show families just how much there is to do at Alaska’s parks and rec areas. Later in the summer on Labor Day weekend, we’ll be participating in another Alaska State parks event, Fall Family Adventure day, which showcases fall activities that are great for families in the parks. Next up, though, is the Visit Anchorage Frontline Trade Show, where we’ll have a van on display. The event is held at the Den’aina Center and is directed toward those Alaskans who are also involved in the travel industry and who will be interacting with guests needing more info on where to go and what to do while they’re here. If that’s you, come check out a van, and get a little more info to give to your guests! Another new thing this summer: We now have the ability to offer a primary insurance policy to our renters. We are partnering with a company called Wheelbase, which combines the booking process with insurance option add-ons. You can book your van through our Wheelbase booking page, and you’ll have the option to add a primary insurance policy to your reservation. The cost is 10% of your reservation (not including tax or add-ons), and the policy covers you up to the state minimums. This is great news for our international visitors, whose personal insurance policies often don’t cover rental cars in the U.S., and for those who either don’t have a car and thus don’t already have a policy, or those who have a bare-bones policy that doesn’t cover any extras like rentals or RVs. You must be 25 years old to qualify for the policy, and Wheelbase does ask for your driver’s license info to verify your driving record during the booking process. Take a look at our Insurance page for more info. Right now, we are de-winterizing all of the vans, and making sure they made it through the cold and snow of the winter. We removed all of the tents for winter, so we’re re-attaching them to the roof racks of the vans and making sure we didn’t miss anything when we deep cleaned at the end of last year. We’re removing the last of the winter dust from the vans, we’re reorganizing our office so that we’re ready to welcome our first guests, and we’re re-upping our supply of camp stove fuel so that there’s enough to make all of those recipes we’ve been blogging about. So, are you ready yet for summer camping season? Don’t forget, the Shoulder Season special is available until Memorial Day weekend. Beat the crowds, and get the best price! What are you waiting for? Book now!